Put in at St Pk and fished to Price's Branch. Fished both sides of the lake. 1 early fish on a spinnerbait then nothing on spinner or crank for 3 hours. Threw jigs, lizzards, worms, swim baits and of course the little guy. Wound up with 9 and 8 of them came on Ned. Water temp was a constant 54° visibility to 7' in most places. All but one fish came out of the same cove. It took 3 times fishing it to get the 8 fish but there was no where else to get a bite. The fish were 15-20' deep. Been dealing with a shoulder injury for several days. I can lift my right arm up today and move it around so I think I am ready to make some casts. I am launching out of State Park due to the 20 to 30 mph winds in the forecast. 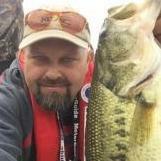 Looking for some staging bass close to spawning banks. I'll even take some brown or spotted fish it they want to bite. I hope there are some with my name on them. I'll be in my red and gray Nitro if anyone else is in that area. Your mom would become the owner upon your dad's death. I think she might be able to get a title for the trailer through your local sheriff's office. I am not sure that you need a title for the motor. Check with your license department about that. If she can get the paperwork done you could get a gift affidavit and have her gift it to you. You are the man bo. The name Norman Boles sure does ring a bell but it has been a long time since I lived down there. Just had an HDS 9 but the money is supposed to be on the way. Nice. I should have been chasing the blacks instead of the whites. Thank you. We stopped at a Nitro dealer one day, my wife saw it and climbed in it. Next thing I knew I had bought it. No I think I was 5th. I put in at the same time as 3 guys from IL. We also left at the same time. They were fishing for blacks and has a 7.11 on a "French fry". Go figure. The water was just the right amount of off color but lots of floating debris. I went about 1/4 mile up the straight stretch above the jog left, jog right. It just did not look right plus I have a new HB sonar and was not familiar enough with it to get my Turnback tail to load and I really like my prop and lower unit. Fished Son's Greezer Turnback and Sac. Struggled to get 9. Most on Arig. Cold fronts often cause them to turn and head back down stream. I have been on them down at Beaver Creek have a cold front come through and they would completely leave the creek.